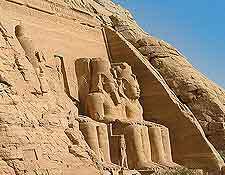 There are two main temples in Abu Simbel, the Temple of Ramses II (Ramesses) and the Temple of Hathor (Nefertari). 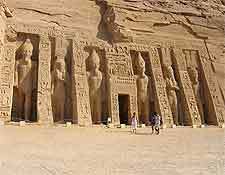 These temples attract literally thousands of tourists to Abu Simbel all through the year, who come to marvel at these ancient monuments. 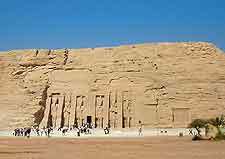 The temples were carved into a mountain face on the western banks of the River Nile between the years of 1274 and 1244 BC, being dedicated to the Egyptian gods of Amun, Ptah, Ra-Horakhty and Pharaoh Ramses. After being threatened by the floodwaters of the River Nasser, the temples of Ramses and Hathor became part of a major relocation project and were successfully moved to their present site, block by block, piece by piece - rescued for future generations. 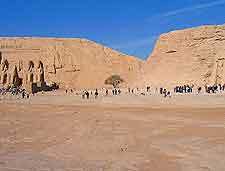 The Temple of Ramses was lost for many centuries, after being completely covered by the shifting desert sands. 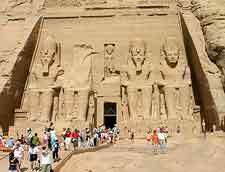 It was not until as recently as 1813 the temple was actually rediscovered, purely by chance, when the Swiss explorer Jean-Louis Burckhardt, who spotted a distant head protruding above the sands around Abu Simbel. After careful excavation, the Temple of Ramses II was revealed and apart from one of the other heads being completely broken off, the facade was in a good state of repair. The forecourt of the temple leads onto a short stairway and ultimately onto the terrace, which is located directly opposite the 30-metre / 98-foot rock facade. Guarding the entrance are four enormous statues of Ramses II himself, who is shown staring into the distance, presumably enjoy the spectacular views. Each of the statues tower over 20 metres / 66 feet in height and are accompanied by a number of small statues depicting Queen Tuya (mother of Ramses II), Nefertari (his wife) and a number of their children. 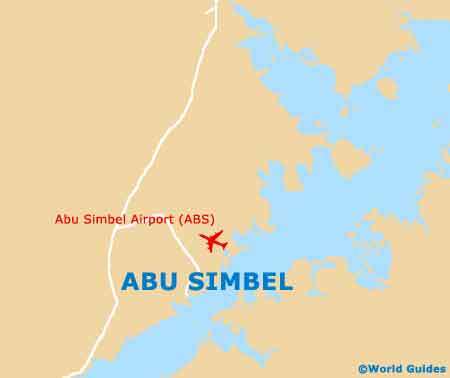 Tourists visiting Abu Simbel are strongly advised to explore the authentic recreation of the interior, which features a large hall decorated with stone sculptures of vultures, and supported by no less than eight grand columns. Each of the columns have their own 10-metre / 33-foot statue of Ramses, while close by, the various reliefs and hieroglyphics depict various scenes from the Pharaoh's history. The rock-cut Temple of Hathor is the smaller of Abu Simbel's two famous temples and was dedicated to the beloved and extremely beautiful wife of Ramses II, Queen Nefertari. This temple is very similar to the adjacent Temple of Ramses II, although only smaller in scale. The front is adorned with six larger-than-life statues, four of which represent Ramses himself, while the remaining two depict Nefertari. Step inside and you will discover the 'hypostyle' hall, where the walls boast many beautiful reliefs depicting Nefertari and the ancient Egyptian goddess, Hathor, who was worshipped by named dynasties and ever by the Scorpion King himself. Explore the vestibule and the adjacent chambers, which are home to many colourful scenes from the past.